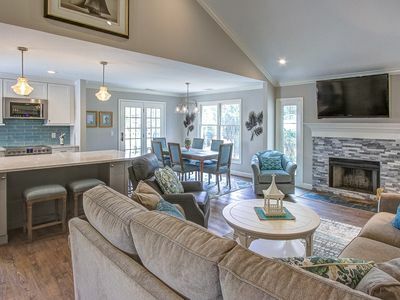 Luxurious three-bedroom, two-bath vacation home with two car garage, features two private decks in the middle of a tropical and picturesque setting in Sea Pines Resort. 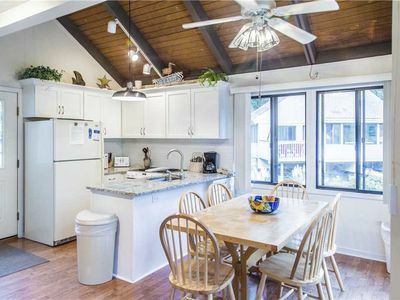 Unlike condo living, enjoy the privacy and seclusion of this quiet, comfortable home. 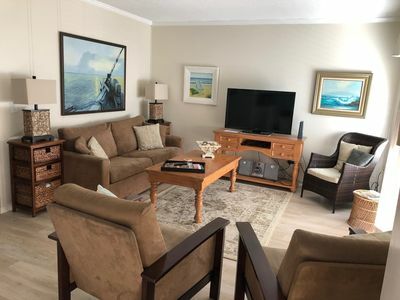 Centrally located - just minutes by walking or bicycling to beaches, pools, golf, tennis, bike trails, shopping, and legendary South Beach and Harbour Town. Our home is newly decorated with upscale furnishings and every amenity possible, including a large screen HD TV in the living room. This exceptional home exceeds traditional standards, is light and airy with numerous sky-lights, and beautifully coordinated designer furnishings throughout. Included are all new mattresses and upscale linen in all bedrooms to insure your comfort. 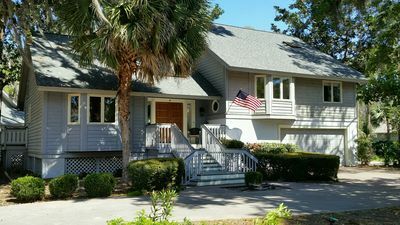 This beautiful home is located on a quiet cul-de-sac, in a residential area of Sea Pines Resort. Our home has been recently redecorated. 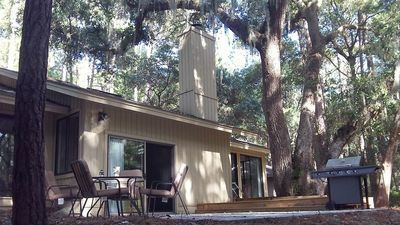 Spacious (2000 square feet) and bright, our vacation home is located in the heart of Sea Pines Plantation next to the sixth hole of the renowned Harbour Town Golf links golf course and is central to all of the Sea Pines attractions (Harbour Town, South Beach, Beaches, Golf and Tennis). 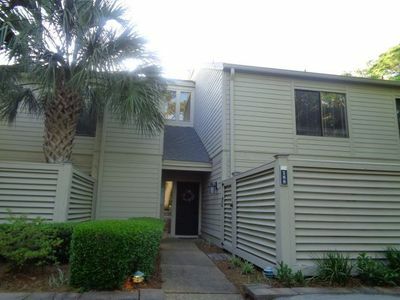 Walk or bike to anywhere in Sea Pines. Bicycles, Bicycles, Bicycles. Do not bring a thing. Our guests have the use of eight bicycles, ten speeds or cruiser, with four 26-inch, two 24-inch bicycles and two 20-inch bicycles. 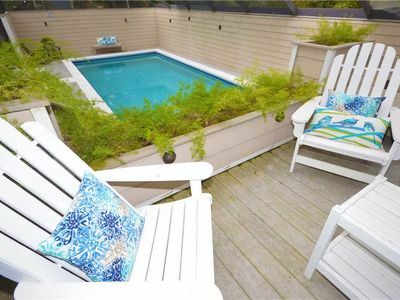 The house is also stocked with beach chairs and boogie boards for your enjoyment. Walk 100 yards to our community center with a pool, tennis court, and a children's playground. The restaurants and shops of South Beach Marina and the Calibouge Sound lie to the southwest. 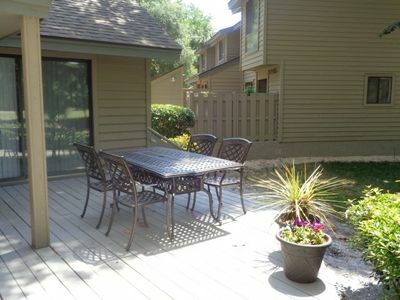 Walk, bike, or drive to the championship golf courses, tennis courts, or beaches. 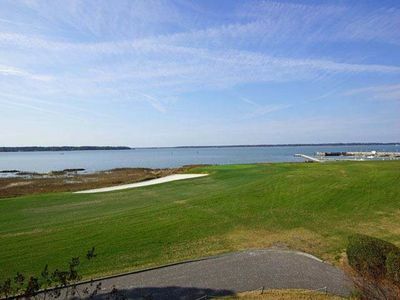 Walk to the Harbour Town Golf Links, Home of the WorldCom/Heritage Pro Tour Golf Tournament. 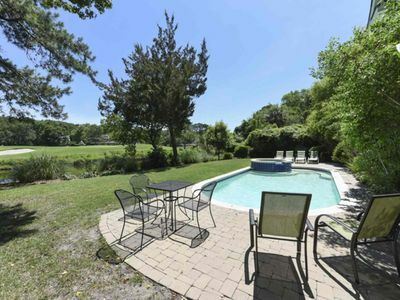 Walk or bike to the Sea Pines Racquet Club, former host of the Family Circle Tennis Tournament and run by Stan Smith. 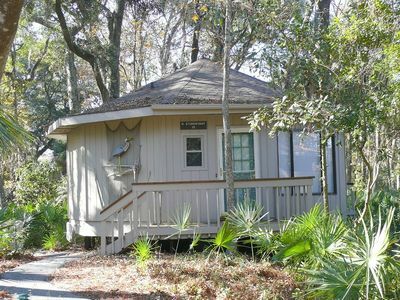 Walk to the Sea Pines Center for your morning coffee, croissant and newspaper. 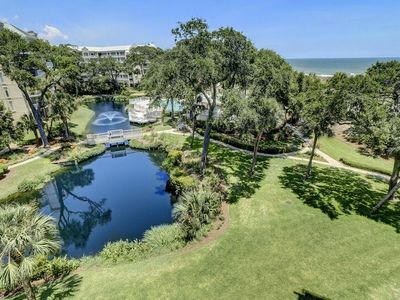 Enjoy your vacation in this Hilton Head Island gem. Special Discount for weeks May 18-25 & Ma25 - June 1. Contact Owner for Details! 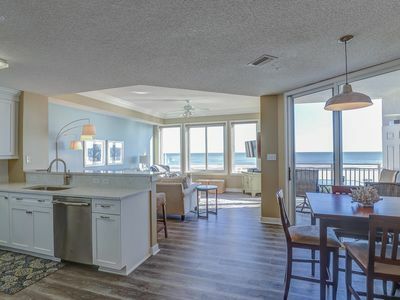 Pet Friendly Beach Bungalow - Short Walk to Gorgeous Beach, Everything you need!